A couple are out frog-gigging. The woman thinks she sticks a frog, but then realizes she stabbed a dead body. In St. Augustine, Florida, two bodies are found in a wooded area, one man and one woman. One of them had all her blood removed. Both went missing three days ago. A woman named Andrea Gambrell drives to a cemetery to meet a man, who puts a blindfold on her. She tries to get away but he grabs her and sticks a needle in her. The medical examiner tells Lewis that the blood in the man's body isn't his. It belongs to the female victim. He also tells her the outline of a small triangle was cut into his calf muscle. The ME later tells Lewis that the male victim had animal DNA in his system: jellyfish and turtle, specifically. 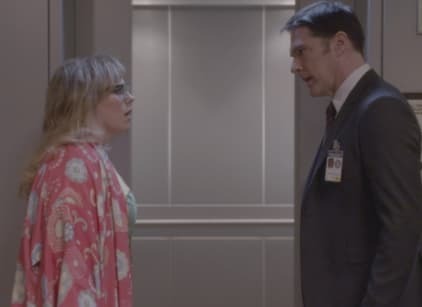 Hotch learns that Gambrell had worked at the same restaurant as the dead female. The unsub wheels Gambrell down a hallway on a hospital gurney. The BAU theorizes that the unsub is doing medical experimentation, by draining the blood from one of his victims and using it to replace the blood of another. Gambrell comes awake just as the unsub puts a gag in her mouth. She turns to her left and discovers a male victim on a gurney next to her, similarly restrained. The man's name is Harold McDermott. Eileen and Ben Kebler learn from Doctor Braga that Eileen is dying and doesn't have more than six months to live. As they leave the office, an orderly comes in with a wheelchair for her. The orderly is the unsub. Garcia discovers a group calling themselves "the Mad Scientist Club." The student group regularly used to meet to talk about experimental ways to cure disease. The group popped up on Garcia's radar because of where they used to meet: at the same cemetery where Gambrell was abducted. McDermott dies on his gurney. The unsub tries to save him but fails. He begins beating up the man's corpse. The unsub destroys the aquarium where kept a supply of jellyfish. The unsub visits Ben and Eileen at their home. He tells Ben that he has something that could save his wife. The unsub identifies himself as Robert Boles. Boles promises to save his wife using his "special formula" transfusions. Ben agrees and the transfusion is administered. He tells the couple he will come back in three days. One of the former members of the Mad Scientist Club comes in to be interviewed. Her name is Diane Haller. Haller tells Lewis about one member of their club who made them all feel uncomfortable. They nicknamed him "The Magic Man." She could only recall his first name, which she thought was Richard or Robert. Eileen comes out of her bedroom and tells her husband she feels much better. She asks him to take her out for a walk. Dr. Braga catches Boles raiding her medicine cabinet. She moves toward the phone to call security. Boles bashes her over the head with a hammer, killing her. Boles moves her out of the hospital in a body bag. Rossi and JJ go to Dr. Braga's office where they find her blood on the floor. JJ, Lewis and Rossi theorize that the unsub is choosing DNA from animals that are known for their longevity. He's looking for the elixir of youth. Boles tells Gambrell a story about when he was a kid. He tells her that he was there to visit his uncle in a nursing home. Only he went into the wrong room and met an old man who hardly looked human. The man told him he would one day look like him. That started Boles on his search for eternal youth. He injects Gambrell with a drug that knocks her out. Eileen gets very ill. Ben calls Boles who tells him to bring her to his lab for another transfusion. Garcia identifies the unsub as Boles. Garcia identifies one of Braga's patients who hasn't shown up in a few days, as Eileen Kebler. Boles brings Eileen into the lab room with Gambrell. He takes a scalpel to Gambrell's chest. Morgan alerts Hotch of the delivery of an aquarium to an unusual location: the parking lot of a closed medical facility. They suspect that's Boles' location. JJ, Hotch and Morgan race to Boles' location. They capture Boles, preventing him from cutting into Gambrell.